The new version of Google Earth is awesome. You can read all about the new features at their blog, or go check it out for yourself. However I am disappointed. Photo-realistic 3D buildings are a nice improvement over the old gray shapes they called buildings. Also, the ability to click on a building and have information pop up is very slick. What disappoints me is when I head over to 14 N. Moore St. in New York, NY there is still a big gray rectangular prism. There should be a clickable photo realistic firehouse. 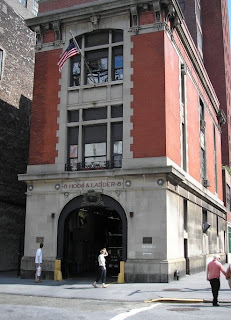 It's only the most famous firehouse ever. Here is a picture for you Google. Get it right in the next version. We'll talk about Dana Barrett's apartment building in the next release.